Harar is located in the eastern part of the Ethiopia. The city is located 523 Kms east of Addis Ababa. It is part of the historic circuits. Harari people are Semitic in origin and also known as Adare mainly living in Harar town in the eastern part of the country. They are specifically known for their two storey houses called gegar and for their very colorful traditional customs still worn by many Harari women to this day. In the past the Harari were known as great craft people, weavers, basket makers, and book binders. The city is embraced by a strong wall encircling it. The walls of Harar were pierced in early times by five gates, a number supposed to symbolize the Five Pillars of Islam. These gates, known to the Hararis as bari, were situated respectively to the north, east, south-east, south, and west of the city. Each had its own distinctive name, and provided entry and egress to caravans traveling to and from different stretches of the surrounding country. Each of these gates thus played a different role in the economy of the city and of neighboring lands. The northern gate, for example, was known as the Assum Bari, because it was used by traders importing pepper and salt, from the Gulf of Aden coast of Africa; while the eastern gate was called the Argob Bari because it served merchants handling the lucrative trade from Argobba, one of Ethiopia’s inland regions. 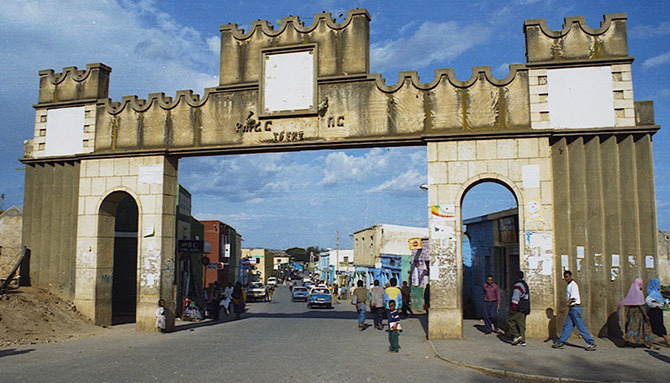 The gates of Harar in olden days were strongly guarded, and were strictly closed at night - for no one was allowed to enter or leave the city during the long hours of darkness. Strangers wishing to enter Harar in daytime had first to deposit their spears, guns and other arms with the cities guards, who would look after them scrupulously, and return them when their owners were ready to leave. The walls had, however, a number of holes placed to allow the drainage of water and sewage and to enable hyenas, who constituted the principal garbage collectors. Some of the most visited places in Harar include a building by Emir Nur a five large gates supported by oval towers, Mosques and Muslim shrines, Handicrafts, including weaving, basket-making and book-binding, Silversmiths, Gate of the Duke and Berbera Gate, Ras Makonnen’s stately old palace, Rimbaud House, Jami mosque, Gidir Megala, Big market, Hyena-man, feeding of the wild beast in the evening. While in Dire Dawa, Afetiessa market, Lege Oda, cave paintings, Railway town and station.